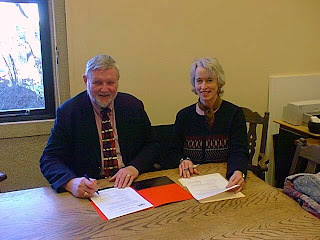 On January 8, 2003, the directors of the Port Townsend Marine Science Center and The Burke Museum of Natural History and Culture in Seattle signed a Partnership Agreement. Although the organizations had enjoyed a long-standing relationship of cooperation and collaboration, Directors George MacDonald (The Burke Museum) and Anne Murphy (PTMSC) decided to move forward with a formal agreement. A key element of the agreement was membership reciprocity, allowing members of each organization to have full member benefits at the partner organization. This included, and still does, free admission to exhibits, discounts at gift shops, discounted admission to education programs such as lectures, workshops, special events, residential programs and cruises. The Burke Museum has offered the PTMSC specimens appropriate for display in their Natural History Exhibit and advice/assistance on fabrication of casts of specimens over the years. As a demonstration of their intentions, Burke Museum curators Liz Nesbitt and Ron Eng presented an exquisite cast of a fossil salmon to Anne Murphy at the agreement signing. This is on permanent display in the Natural History Exhibit. The original fossil of a Sockeye Salmon was found on the Olympic Peninsula in 2002 and is believed to be one million years old.